After a very busy week at work, it was great for a full weekend with my mom doing wedding things and reading! We cooked, we shopped, and we read some more, couldn't have asked for more. I loved LOVED The Opposite of Me! I purchased These Girls today and I cannot wait to read it. I have several library books to finish first, so hopefully I will read it soon. Since I don't recognize these I'll be interested in your reviews. It looks like you have been on a Sarah Pekkanen marathon. I hope you enjoyed them! I enjoyed The Opposite of Me...so now I want to read more of this author's books. Enjoy! How is it I have never heard of any of those books! #bloggerfail! Well I hope you have a great week! Good luck with that TBR pile! I adore Sarah Pekkanen! I hope you really enjoy that one! Sounds like you got a lot accomplished! My favorite read this week was Son of Neptune by Rick Riordan. Please come see what else I'm reading. 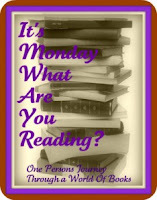 Seems as though you have a wonderful week of reading ahead of you - I hope you enjoy them! Ooo you got through lots of books this week! I'm jealous because me reading is mega slow at the moment! Need to speed it up! I am slowly making my way through Robyn Carr's Virgin River series - I just finished reading book 7. I read Sarah Pekkanen's The Opposite of Me last year and really enjoyed it. I'll have to look into Love Accidentally. Can't wait to hear what you thought of the Robyn Carr book :) Love her!